Living in Austin has been wonderful so far. In a lot of ways, making a big move like this is truly allowing us to set the proverbial “reset button.” As quickly or slowly as we feel like it, we can reincorporate aspects of our old life here and start new habits as well. One of the new habits I’ve wanted to cultivate in Austin is yoga. I’ve done it on and off since high school, but wasn’t really digging the workout-focused classes that I went to with friends in Chicago. Coming here, I knew I wanted to find a class that not only was physically beneficial, but mentally as well. Thankfully, I happen to live just over a mile away from a fantastic yoga studio with this more spiritually minded slant. In my first class last week, the teacher discussed the concept of santosha, which means contentment, or harmony. As he went deeper into the term, he explained that santosha involves using the word “and” rather than “but” to describe our circumstances. Contentment is not achieved, in a santosha sense, by only having “good” things in our lives. Santosha is about allowing the good and the bad circumstances in our lives to live together without overshadowing one another. Imagine that you have one good thing happening right now in your life sitting in your left palm. Hold it there in your mind’s eye. Then, imagine one not-so-good thing in your life right now in your right palm. Hold it there in your mind’s eye. The trick is to sit there with both experiences in open palms – without clinging to the good with your fist, nor crushing the bad with your fist. We simply allow each experience in both hands to co-exist. While this might sound a little theoretical, it is extremely practical. I am healthy, BUT the cellulite on my thighs is more noticeable. I love my job, BUT I’m not in a relationship and that makes me really sad. I finally started that business I always dreamed of, BUT it’s not successful enough to take-full time yet. These “buts” cast shadows over the good in our lives. They seem to negate the positive. Of course, we could always try to invert this scenario and use the positive to block out the negative… but that doesn’t always feel genuine. It doesn’t give ourselves permission to experience our full range of emotion. On the other hand, santosha allows each circumstance, good or bad, to exist without negating one another. I love my daughter deeply, AND her temper tantrums really wear me out. The weather is beautiful today, AND my boss is difficult to deal with. I finished my third marathon, AND I didn’t finish in the time I wanted. That meal was spectacular, AND the waiter wasn’t kind. For the next week, try noticing every time that you are tempted to complain internally or aloud about a circumstance. It can create a more balanced awareness and ultimately, contentment. 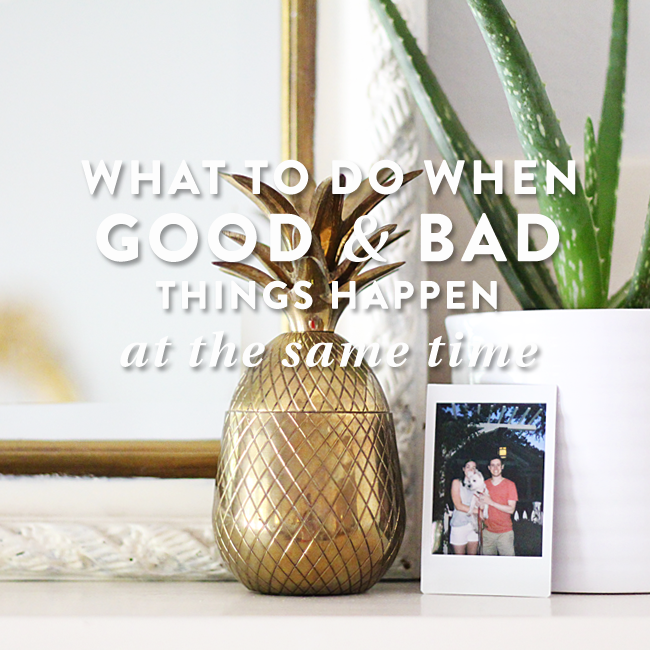 Feel like GOOD & BAD things are happening at the same time? Please read this. PS – I am working behind to scenes on getting Life With Intention Online 2.0 up and running! I’ll be sharing more details in the next few weeks, but you are interested in special bonuses too, sign up for more info here.